If Tel Aviv isn’t on your list of places to visit with the kids, it should be. 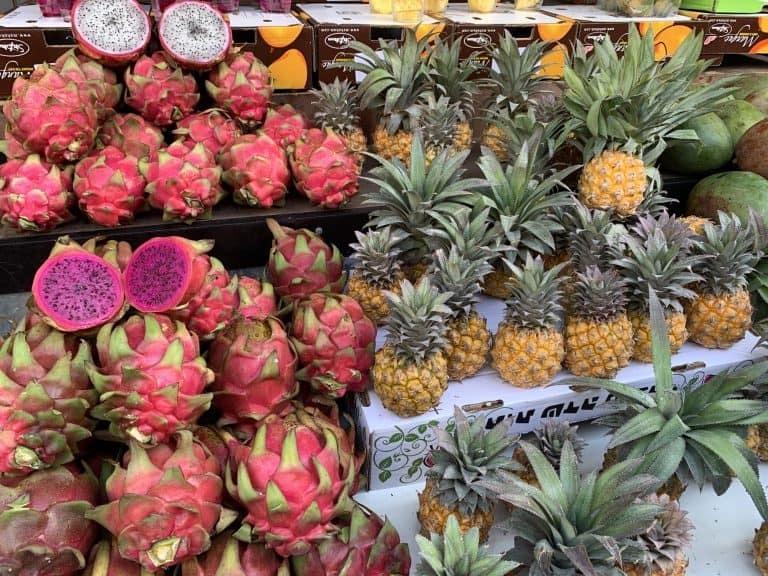 A coastal city and the second largest city in Israel, Tel Aviv has a burgeoning culinary scene, a plethora of shops and markets to explore, beaches, historic neighborhoods, and it’s a great base for exploring all of Israel while traveling with kids. You can spend a day in Tel Aviv with kids shopping until you drop or simply taking a stroll down the beach, having a coffee on the beach, or wandering through the historic and trendy Jaffa, an ancient port city filled with art galleries, restaurants, theaters, and museums. It’s also the home base of many major technology companies and the city’s electric vibe reflects that. A visit to Tel Aviv means ample opportunities to really experience the modernity and the best of Israel. Here is our list of the top ten things to do in Tel Aviv with kids. The Carmel Market (or Shuk Hacarmel in Hebrew) has everything including; Judaica, household goods, fresh fruit, vegetables, sweets, and falafel. Located in the center of Tel Aviv, the market has been around since the 1920s and is open daily. A visit to Carmel Market will literally have your kid’s eyes popping out at every turn. It’s both busy and exciting and is the perfect place to pick up Israeli spices, fish, meat, and halvah. The prices are low and you can haggle with its friendly yet aggressive merchants. There are several great Israeli restaurants in and around the market, particularly in the adjoining Yemenite Quarter. Be sure to enjoy a delicious plate of hummus, bourekas (savory pastries), or Israel’s famous egg dish called shakshuka. We recommend Shukshaka at 41 Simtat HaCarmel, Hummus HaCarmel at HaCarmel Street 11, and M25 at Simtat HaCarmel 30. The Carmel Market is open from Sunday to Friday from the early morning until around 7pm, with an earlier closing on Friday, ahead of Shabbat. Be sure to also visit Nachlat Binyamin Pedestrian Mall on Tuesdays and Fridays. It runs down Nachalat Binyamin Street and features handmade work by over 200 artists. The beaches in Tel Aviv are great places to while away an afternoon. The coastal strip along the Mediterranean Sea is fourteen kilometers long. It includes thirteen beaches where families can ride the waves, collect seashells, build sandcastles, have ice cream cones, and enjoy the warm sun. Be sure to put ample sunscreen on everyone, wear hats, and bring towels. Traveling with kids can’t get better than this with Tel Aviv’s clean, safe, secure beaches where there are showers and restaurants. Popular beaches include Metzitzim Beach, Frishman Beach, and Gordon Beach, where you’ll find swimming pools for young children. 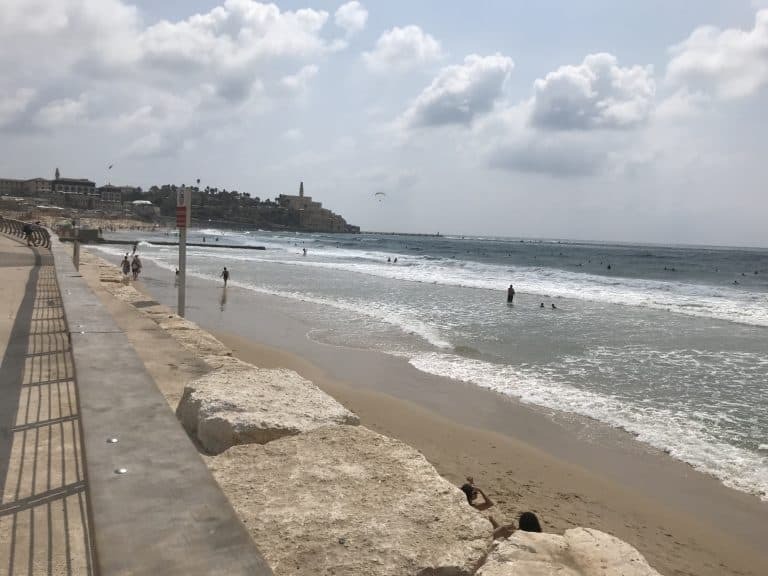 We’re a fan of Alma Beach, which is near the hip neighborhood Florentin and the trendy Tal Hotel, with cool restaurants and a nice vibe (mentioned below). Because this is Israel, there are also beaches for religious people. Beaches are open all year long. Lifeguards are on duty all year but their hours vary. Traveling with kids in Tel Aviv is more meaningful when you get inside the life of a country with a very intense history. 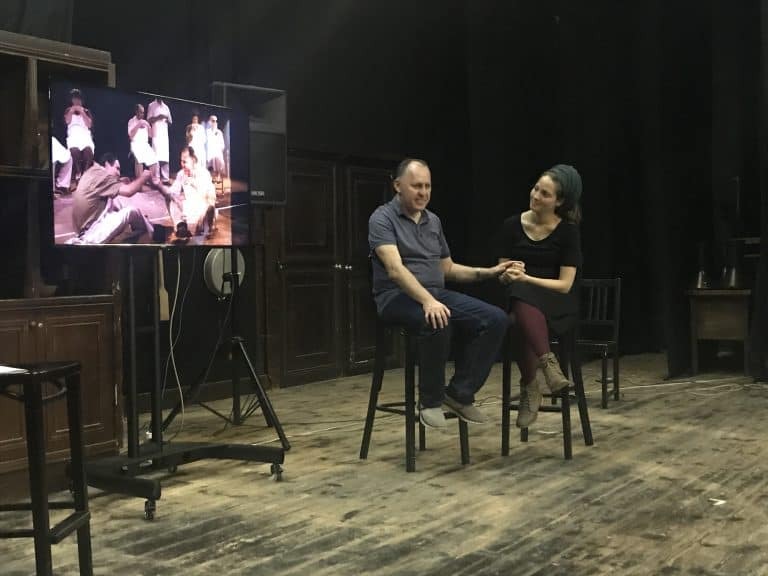 The Nalaga’at Center in Jaffa is a professional theater for deaf and blind actors and a great place for your kids to experience a different side of Israel. Many of the actors suffer from a genetic disorder called Usher syndrome, which results in acute deafness at birth and then a gradual loss of vision. The Center offers them a way to express themselves. Seeing one of their productions is an extremely meaningful experience for parents and kids alike. Check the Nalaga’at Center website to see what plays are being offered during your visit and if time permits, plan on visiting BlackOut, a popular restaurant where patrons eat in the pitch dark and are served by blind waiters. The Nalaga’at Center is located at Ratzif Ha’Aliya HaShnia in Jaffa Port. Its hours are Sunday through Thursday from 9am to 10pm. If you have a rental car, head to The Bullet Factory at the Ayalon Institute. 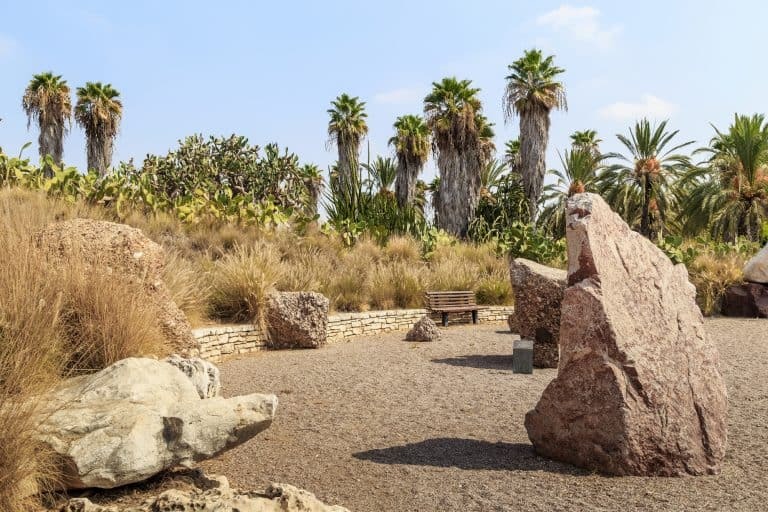 Located just 30 minutes south of the city, the museum offers a unique look at Israel’s complicated history. It was a secret ammunition factory before the country was founded. It was disguised as a kibbutz (agricultural community) to fool the British. Jewish workers produced more than two million bullets used to fight for the country’s independence. Be sure to take a tour, so your kids will fully understand the museum’s significance. Be sure to see its secret entrance, learn about the machines, and hear about the people who worked there. The Bullet Factory is located at David Fikes Street 1 in Rehovot. Be sure to book your tickets in advance as tours book up and tickets are required. The museum is open from 8:30am to 4:30pm Sunday through Thursday and from 8:30am to 2pm on Fridays. Saturdays, on Shabbat, it’s open from 8:30am to 4pm. If you have a technology-obsessed child while traveling through Israel, he or she will fully appreciate a visit to Taglit Innovation, located at Tel Aviv’s stock exchange. 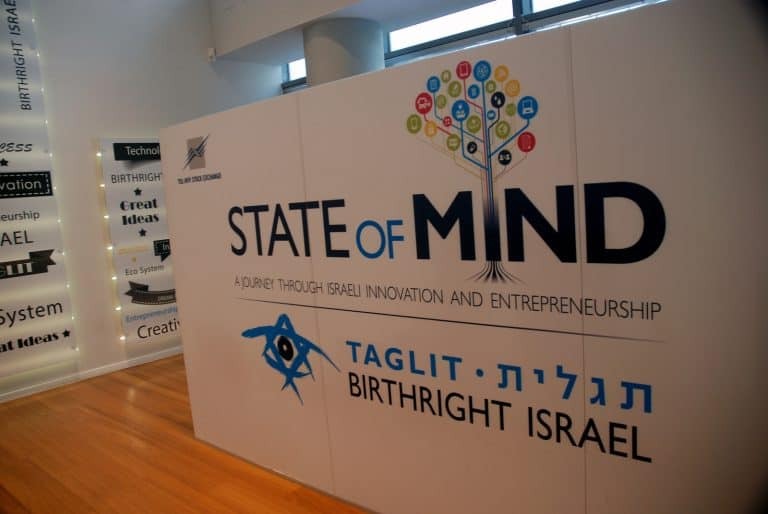 After all, there are over 4,000 startups in the country of Israel alone and Israel has been coined “StartUp Nation”. Taglit Innovation is an interactive exhibition about advancements in various fields including science, agriculture, security, medicine, security, space, and more. A short movie that demonstrates the unique story of the Israeli high-tech industry. A tour concludes with an overview of the Israeli start-up ecosystem or a session with an inspiring Israeli Innovator. The museum is open Sunday through Thursday from 9am through 6pm. Be sure to book tickets in advance. Jaffa is the original port city from which Tel Aviv spawned. It’s also a place where Jews and Arabs co-exist peacefully. It sits on the coast and an iconic clock tower stands in the middle of the city, which is made of two parts, the old and new. The old city consists of art galleries, Judaica shops, restaurants on the sea, and a cobblestone piazza. Then there’s the famous flea market in the newer section, which is also residential, that’s filled with stalls selling antiques, Middle-Eastern clothing and jewelry, and trinkets. The area is very multicultural, vibrant and popular with tourists and residents alike there to frequent its many boutiques and restaurants. Don’t miss a visit to Abouelafia at Yefet Street 7 for an assortment of delicious bread, Cafe Puaa at Rabbi Yohanan St 8 for an Israeli meal, and Abu Hassan, a very famous hummus restaurant and one of the best, at Ha-Dolfin Street 1. Jaffa Port also demands exploration when traveling in Tel Aviv with kids. There you will find a beautiful walk along the sea with interesting restaurants and boutiques built in what used to be old warehouses. Neve Tzedek is a small neighborhood near Jaffa that is worthy of a visit. It’s a lovely part of town, filled with renovated homes and unique shops and restaurants. On Shabazi Street, its main drag, there are designer shops, vintage clothing and boutiques, Judaica shops, craft shops, jewelry shops, and charming restaurants. Restaurants we love include Dallal at 10 Shabazi Street and Suzanna at 9 Shabazi Street. Families will also love HaTachana, the old Jaffa railway station, which has a multitude of restaurants and boutiques and makes for a great night out in Tel Aviv for families. 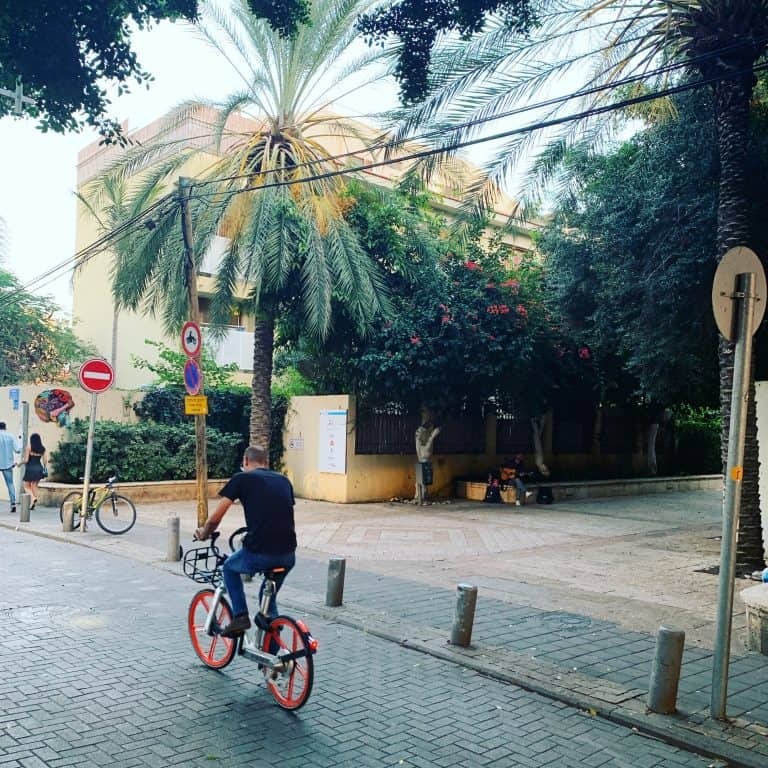 The merchants in Neve Tzedek are open daily but note that on Shabbat everything goes quiet except several restaurants, such as Suzanna, which stays open. HaTachana is open 10 a.m. to 10 p.m. daily. Every Thursday from 7 p.m. to midnight is Unique night, when Israeli designers, artists, and concept creators converge for a trade show that’s open to the public. Located just east of Neve Tzedek, Florentin is another great Tel Aviv neighborhood to explore with your kids. This bohemian neighborhood features Bauhaus buildings, cafes, shops, street music, and an abundance of street art. It’s truly a living museum, and if you are looking for a tour, we recommend Niro Trip led by artist Niro Taub. The art is playful, joyous, and meaningful. 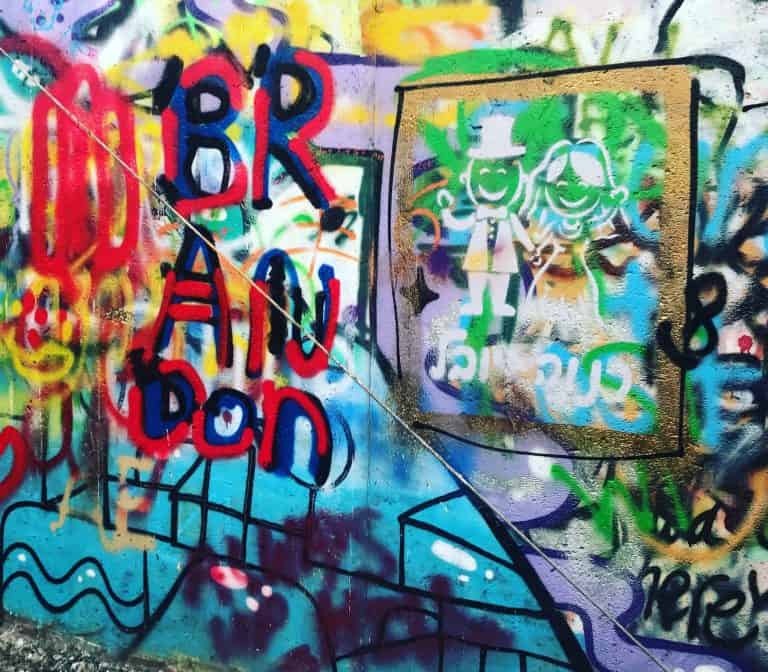 Niro will not only explain its history and importance but he will also take you to an area where you can spray paint the walls yourself. 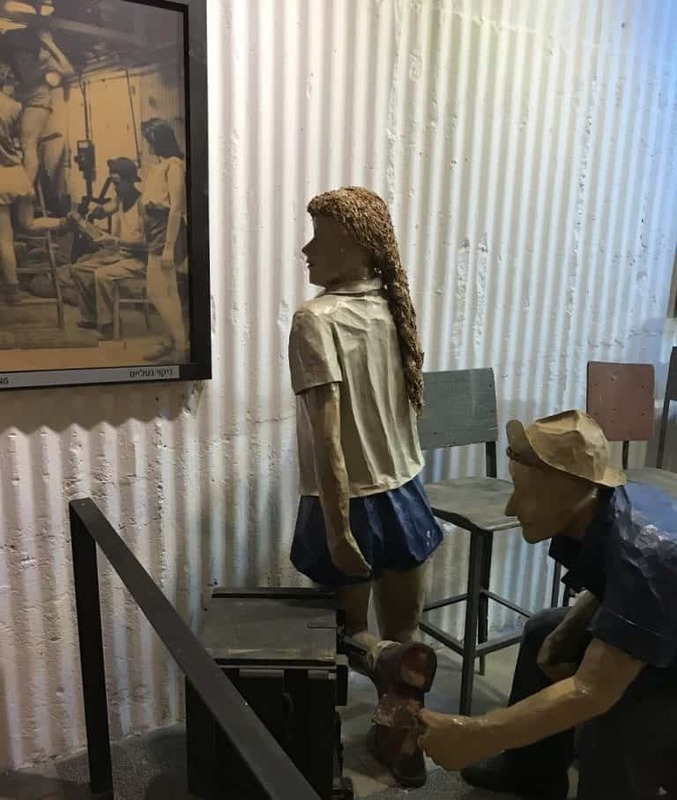 When traveling in Tel Aviv with kids, the Ilana Goor Museum is an extraordinary museum to visit in the heart of Old Jaffa. The museum was founded in 1995 by Ilana Goor, an artist, designer, sculptor, and collector. Her eclectic collection will leave you and your kids speechless with its size and magnitude. Goor has a collection of more than 500 works of art, either created by her, herself, or collected by her over a period of the last 50 years. There are paintings, sculptures, video art, art from all over the world, antiques, drawings, and design objects. 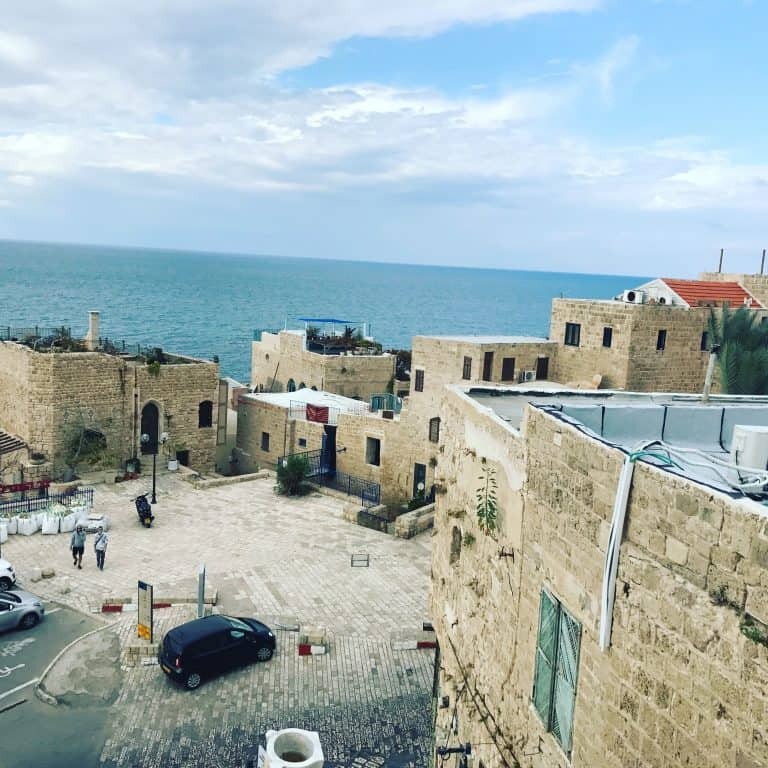 While you’re there looking around, enjoy the beautiful views of the sea in Old Jaffa. 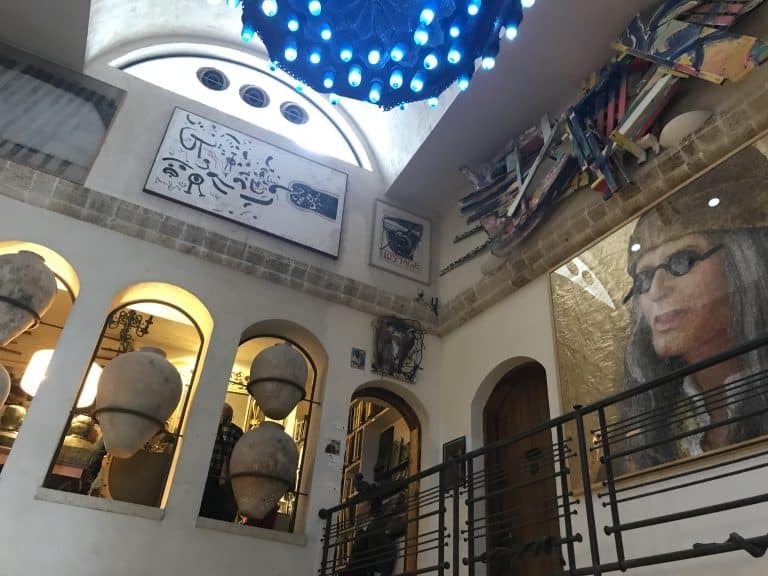 The museum is located at Mazal Dagim Street 3 in Old Jaffa. It’s open Sunday through Friday from 10am-4pm, Saturdays and holidays from 10am-6pm, and holiday evenings from 10am-2pm. If your children need to burn off some steam, take them to Yarkon Park. The park, with the Yarkon River running through it, runs from Tel Aviv port all the way past the National Stadium in Ramat Gan. Here you will find play areas, botanical gardens, zoos, and bike paths. You can also rent bikes, boats, go to a bird safari, play mini golf, climb a climbing wall, go on a children’s train ride, and rent a model yacht in Yarkon Park. Plus. Meymadion Water Park, one of Israel’s largest water parks is conveniently located in the park which any trip to Tel Aviv with kids requires. Just twenty minutes away by car and accessible via public transportation, Herzliya is the perfect place for a beach day away from the Tel Aviv crowds. The sands are white, the beach luxurious, and there are restaurants and shops for families to make for a great experience. Plus, there are water parks and maritime activities to keep kids entertained. 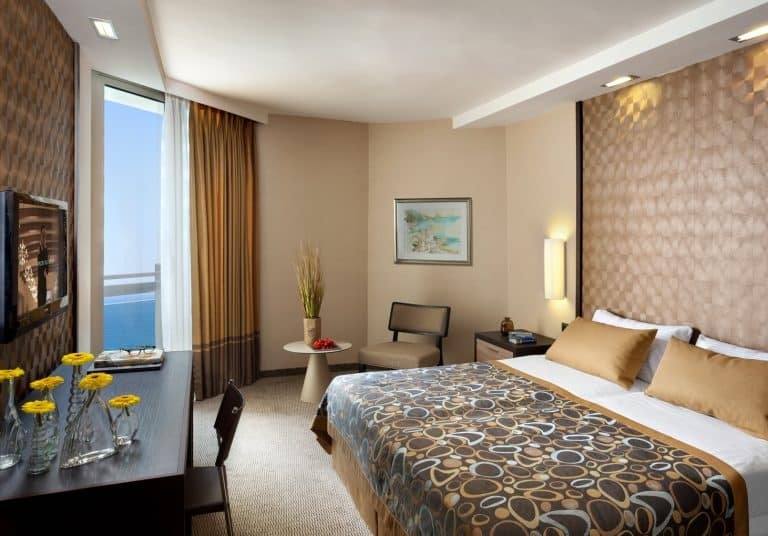 Dan Panorama Tel Aviv is a large, yet cozy hotel located on Tel Aviv’s beachfront. Many rooms have a small balcony facing the sea; the rest face the city of Tel Aviv. 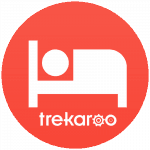 Rooms are spacious and are fully equipped with all the amenities a family would need from ample closet space to lovely bath soaps to complimentary Wi-Fi and portable cribs. The hotel has on-site dining and the hotel is near a slew of good restaurants and a plethora of shopping sits just blocks away. Be sure to save plenty of time for their large, delicious Israeli style buffet breakfast. Dan Panorama is located at Kaufmann Street 10. Check for deals on family-friendly hotels in Tel Aviv.